Thanks largely to growth in construction and improved consumer confidence, jobs in California and Orange County are expected to grow in 2015. Thanks largely to growth in construction and improved consumer confidence, jobs in California and Orange County are expected to grow in 2015 by 2.9 percent and 2.7 percent, respectively, according to the A. Gary Anderson’s Center’s updated economic forecast for 2014, presented today. President Jim Doti, left, and Professor Esmael Adibi, director of the Anderson Center for Economic Research, presented the 2014 economic forecast update at The Segerstrom Center for the Arts. 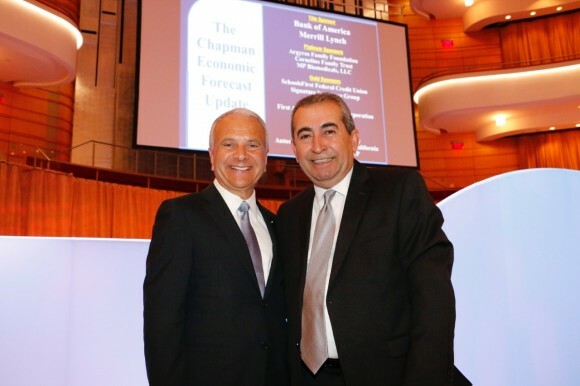 “The current recovery has legs and should continue,” said President Jim Doti, who presented the update along with Esmael Adibi, Ph.D., director of Chapman University’s Anderson Center for Economic Research. 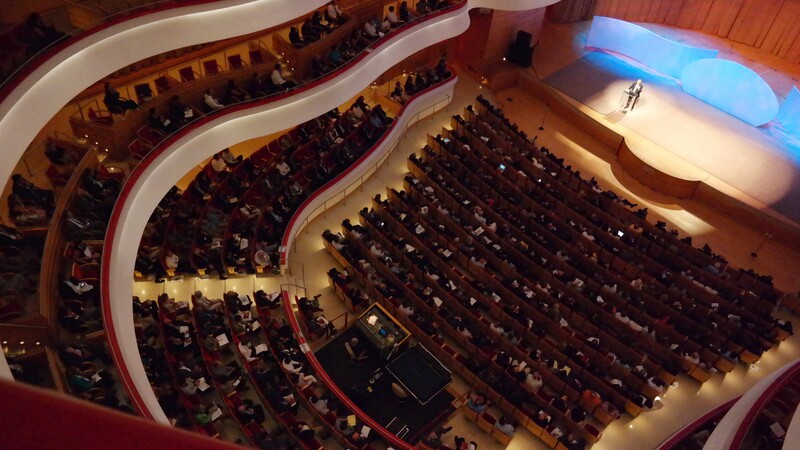 The two presented the update at the Segerstrom Center for the Arts in Costa Mesa, Calif.
Tempering that news, though, is concern that as housing prices recover, the cost of housing may drive employers and younger workers out of state. “In a couple of years, when we’re back to pre-recession levels, we’re going to have to look at more structural kinds of factors that determine where businesses locate, where they form jobs and increasingly in a very competitive global economy, where will the costs be lower. That is not in California right now. 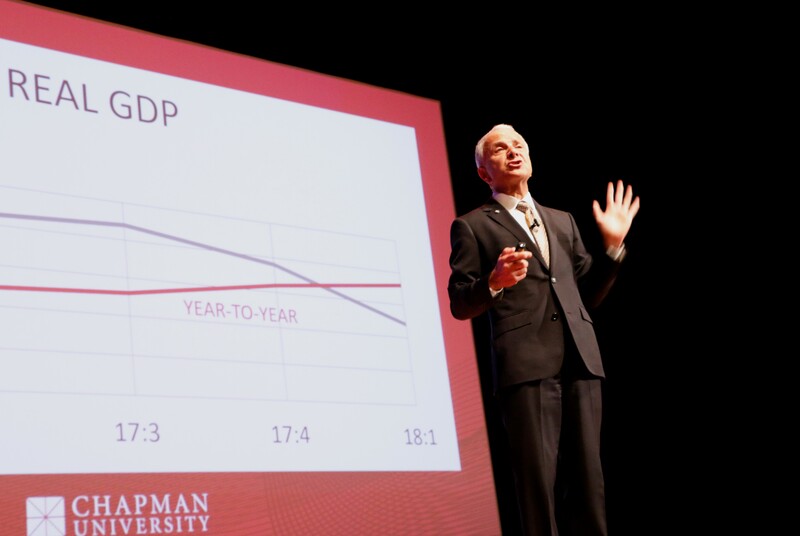 We have to deal with that,” Doti said. 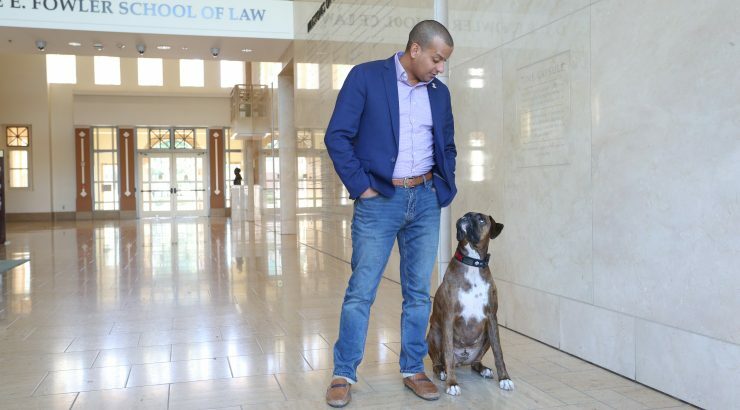 , faculty and students of the George L. Argyros School of Business and Economics have maintained and regularly updated the model and disseminated the results of their research to the business community. Although the Fed’s expansionary monetary policy is winding down in terms of open market operations, there are already historic levels of credit available in the financial system to fuel investment spending and consumer credit growth. The continuing bull market, coupled with higher housing prices, has pushed household wealth to its highest level ever, above $80 trillion. With household debt service payments as a share of disposable income reaching historic lows, consumers have the wherewithal to keep consumer spending growing at rates near 3 percent in both 2014 and 2015. On the construction front, housing has served as a major engine of growth since the beginning of the recovery and at times has been the only positive spending force keeping the weak recovery in gear. But the growth rate has declined rapidly since reaching a peak of 28 percent in 2012 and is now projected to fall to 6.4 percent growth in 2014. As the capacity utilization rate nears 80 percent, spending on plant and equipment is projected to continue growing. 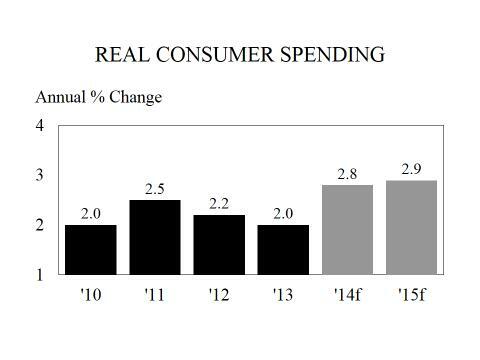 Overall, we forecast that total investment spending will increase 4.3 percent in 2014 and 5.0 percent in 2015. The relatively strong growth in consumer spending and investment will readily trump the negative impact on spending caused by a slowdown in global economic growth and its concomitant effect of reducing U.S. exports. As a result, our forecast calls for real GDP growth to surpass three percent in 2015—the first time that has happened on an annual basis since the recovery began in 2009. Housing prices will vary dramatically on a regional basis. Lower housing affordability, however, will tend to dampen price appreciation on a national basis. By 2015, housing prices will barely keep pace with inflation. Consumer prices are projected to show a buildup of inflationary pressure that will undoubtedly get the attention of the Fed. We are forecasting a 2.2 percent year-over-year increase in the core personal consumption expenditure price index by year-end 2015. The projected uptick in the pace of economic recovery through year-end 2015 will place some upward pressure on short-and long-term interest rates. We see long-term interest rates, like 10-year treasury bond increasing 100 basis points by the end of next year. Short-term rates are forecasted to increase 80 basis points. The benchmark payroll employment data released in early 2014 by the Employment Development Department (EDD) pointed to higher payroll employment growth in California and all of the Metropolitan Statistical Areas of the state last year compared to the preliminary monthly figures released during 2013. In spite of the pickup in payroll job creation across the state, the unemployment rate for California, Fresno, Sacramento and the Inland Empire are sharply higher than the coastal regions. Coastal regions of the state, in general, with more diversified economies outperformed the rest of California and as a result have lower unemployment rates. 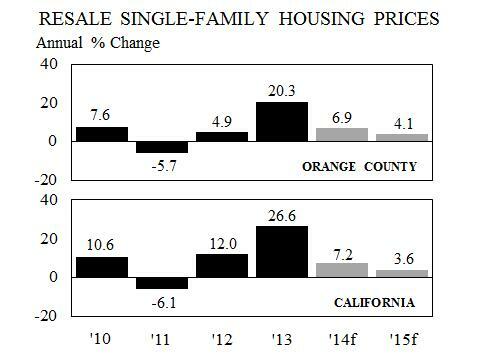 Construction was the fastest growing sector both in Orange County and California. Higher home prices and a limited inventory of unsold homes in many areas induced a surge in building permit activity and a rebound in construction spending. Construction spending in California increased at 11.3 and 23.7 percent, in 2012 and 2013 respectively. We are projecting spending increases of 25.5 percent in 2014 followed by a gradual decline in quarterly spending growth from mid-2014 through next year. 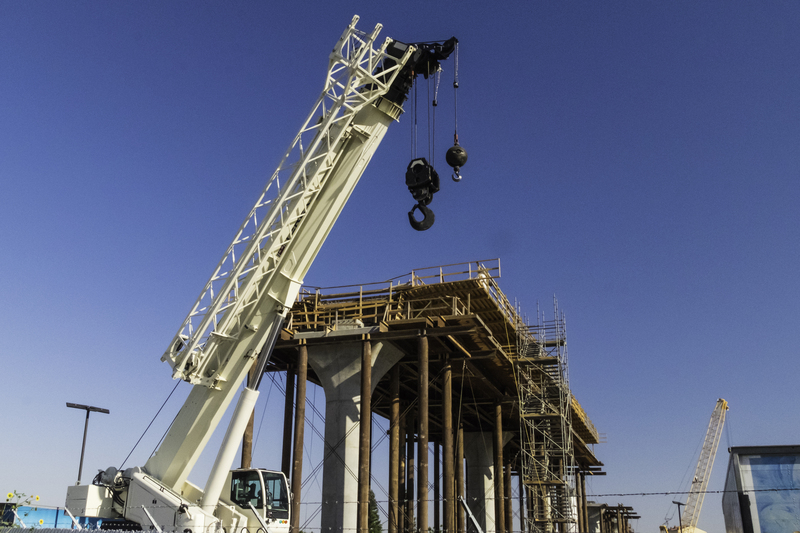 With stronger construction spending and an improving national and international economic outlook, Orange County’s payroll job is forecasted to increase by 2.6 percent in 2014 and 2.9 percent in 2015. This translates to an additional 37,000 and 43,000 payroll jobs in 2014 and 2015. In California, the number of total payroll jobs is forecasted to increase by 395,000 in 2014 and 418,000 in 2015, an increase of 2.6 and 2.7 percent, respectively. The most rapid growth is forecasted to take place in the construction, education & health, professional & business services, and leisure & hospitality sectors. After peaking in mid 2007, median home prices declined rapidly and hit a trough in early to mid 2012 in all regions of the state. A large number of distressed homes, generally cheaper homes, that were sold during that period exacerbated the decline in the median home prices. Similarly, rapid increases in home prices over the last two years were influenced partly by the changes in the mix of homes sold. The net impact on home prices as of April shows an overall gain of 4.0 percent in Santa Clara area to a decline of 35.0 percent in Los Angeles over this housing cycle. We believe that the high rate of price appreciation experienced over the last two years is not sustainable in the future and some cooling off is in the offing. Investors who comprised a relatively large portion of buyers in 2012 and 2013 are shying away from the California market. And with sluggish income growth, recent rapid home price appreciation and an uptick in mortgage rates, housing is becoming less affordable, particularly for first-time homebuyers. On the supply side, a rapid rise in home prices and tight inventory has incentivized builders to launch new construction projects. The permits drawn in 2013 will be completed by 2014. That, in turn, will increase the supply of new homes. The inventory of resale housing units is also expected to gradually increase. The positive impact of higher job growth is offset somewhat by a higher projected inventory of new and reseale housing units and lower housing affordability. As a result, our forecast points to a lower rate of home price appreciation, in Orange County and California over the 2014-15 period.